The long awaited MRT opening from Semantan to Kajang was finally over as the line was to be officiated on 17 July 2017 at about 10:30 am. The thematic fans of rail stamps were seen early. The stamps and Miniature Sheet are well designed and the queue started before 05:30 am in the Kuala Lumpur Philatelic Bureau. The crowd was more than normal. On opening, the first item to disappear were the posters! Here is the response just before the counters opened. 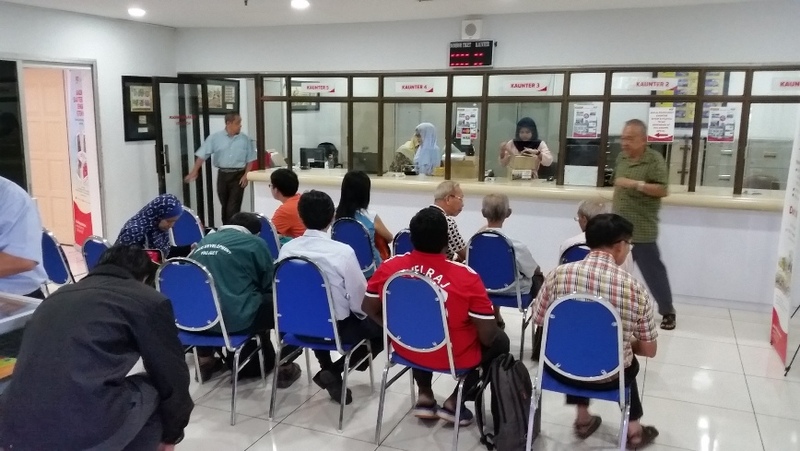 The Kuala Lumpur General Post Office stocks were very quickly sold out by 09:00 am and many hurried to the Philatelic Bureau to buy the items. The empty folders were also sold out before 10:00 am. The response was much better than usual. News from Kajang Post Office was that the stocks were sold out around 09:00 am. Today, many took the chance to make a basic concordant FDC. The basic cancellations will be Sungai Buloh – Kajang (first and last MRT stations). There are 2 other pictorial cancellations near the MRT line, i.e. KL, Sungei Wang and Taman Connaught. Hopefully the trend of making concordant FDCs will take off from here. Many of those I met were excited on quote: “The Amazing Race”. It truly was an amazing race against time to brave the traffic, locate the post office, find a parking spot and rush to the next stop to complete the collection of cancellations. 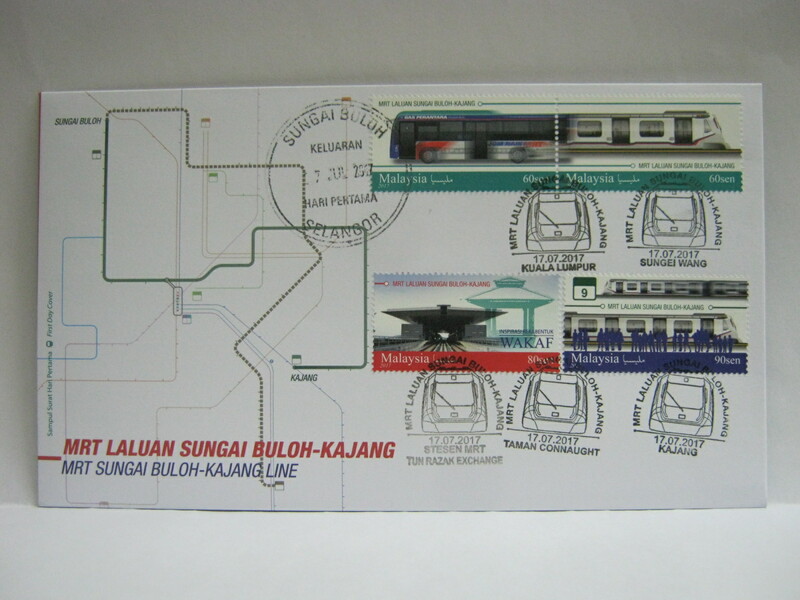 Here is my basic set with all the pictorial cancellations plus Sungai Buloh at the start of the line. The hardest was getting into Kajang town to visit the launch site at the Kajang Stadium. The main road leading into the town was at a standstill even after the Honourable Prime Minister had left the event. Throngs of guest and of course vehicles were trying to leave the area whereas many were trying to get to the other side of town. Kajang Stadium is directly opposite the Kajang Post Office. 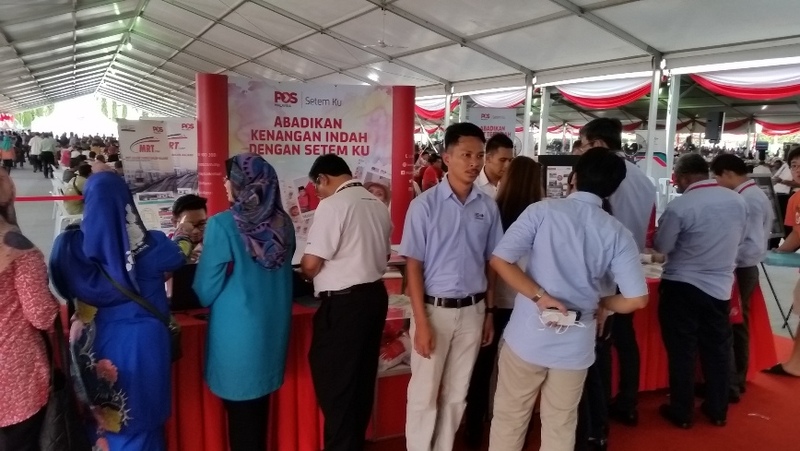 Pos Malaysia opened a booth to sell the products and provide a special “Tun Razak Exchange” (TRX) cancellation. The MRT line was officiated at TRX. However the event was close to invited guests. 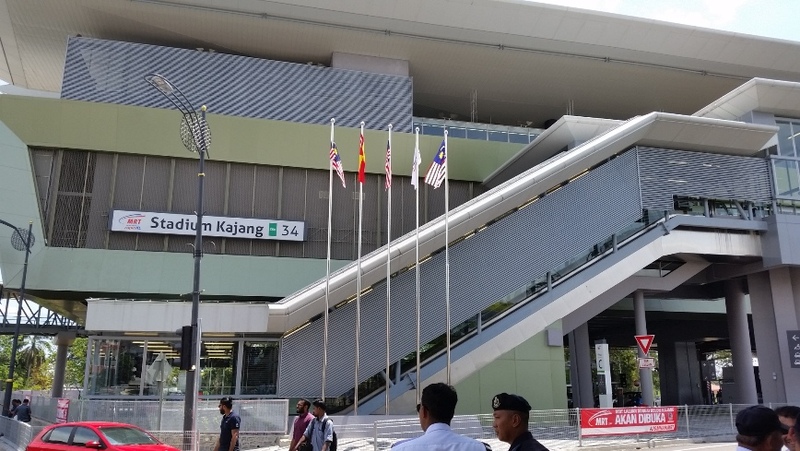 Thus the postmarking was provided at the Kajang Stadium where the celebrations were held. The Pos Malaysia booth was very busy. The staff even had to prepare FDCs on the spot to cater to the big demand. This is the first time that I had to do postmarking on the carpet at the back of the booth! Such was the response and crowd at the time I arrived! I probably should have come later! Meanwhile, a huge Kajang Satay party was still on the way. 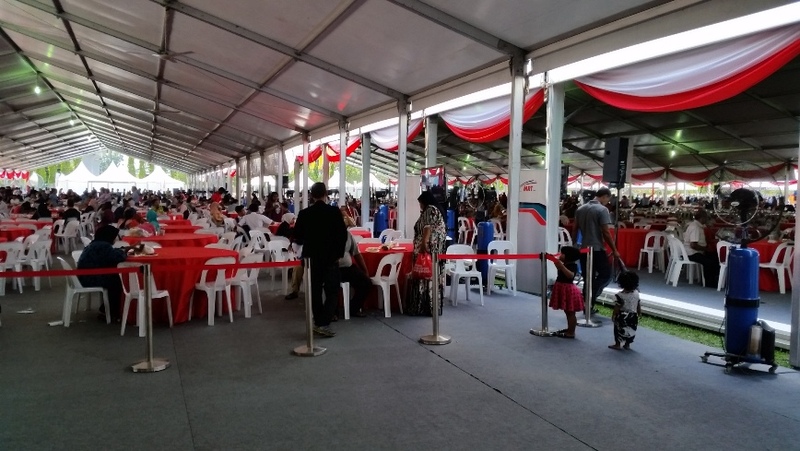 There were stalls with various food and drinks and the public event joined in. This is also the first time that I had time to sit down and join in the satay party! Kajang town is famous for satay. In total I managed to visit 13 post offices to try and match the MRT line. However one of them was closed for lunch as my timing went off. It was not possible to visit all the post offices located along the line in the time available as much time was spent sticking the stamps and getting stuck in traffic! Acknowledgement: MRT line map from MRT Corp. I actually made 4 trial runs to figure out the traffic condition at approximately the time that I will be passing, mapping out the schools to avoid, scouting the parking areas, rest areas and such. Now all that remains is to wait for my covers to come back to me via mail. It was satisfying. The Amazing Philatelic Race was completed slightly after 09:00 pm with dinner near the last stop before heading home!